One often gets the impression that all fascination for modern technology concentrates on ICT: robots, self-steering cars, mobile phones and their apps. Green chemistry, a breakthrough technology too, gets little attention in spite of its development that spans 20 years. ICT is a well-established technology now; green chemistry is still in full development and will pave the road for the next economic development wave. This is the first article in a series on green chemistry. The articles appeared on 5 June, 14 June, 19 June and 12 July 2015. Petrochemical industry is well-established but will be challenged by the green chemical industry. We can contrast green chemistry to petro chemistry, that has dominated chemical industry after World War II. Development of petro chemistry meant to learn how to introduce useful properties into the fossil resource, that had precisely been stripped from all properties during the centuries of its underground existence. A magnificent achievement, that has brought us many wonderful products like plastics and nylon, synthetic colours and a vast array of medicines. Over the years, (petro)chemical industry has been enlarged and magnified to become a very efficient organism, in which each side product has become the resource for the next process. And yet, with our present knowledge of green chemistry, petro chemistry has a touch of primitivism. In petrochemical industry, technologists are very tough on their resources (using high temperatures and pressures, and solvents) to let them produce their useful products. Relatively, petro chemistry means arm wrestling with nature, whereas green chemistry produces its results by waltzing: move in accordance with nature in order to let it do what we would like it to do. In petro chemistry, mankind forces nature, whereas in green chemistry, nature has become our teacher. The secret of successful chemistry is catalysis. Catalysts are compounds that speed up reactions in the desired direction without being altered themselves. In petro chemistry, many catalysts are metals, like nickel and platinum. Green chemistry uses the catalysts of nature itself: enzymes, also called biocatalysts. As a matter of course, these can only perform under mild conditions – for instance at the temperature of our bodies. Because of those mild conditions, chemical industry can rid itself completely from high temperatures and pressures and their concomitant high investments. Therefore, green chemistry is inherently more sustainable than its fossil counterpart. One of the forerunners in green chemistry is Reverdia, a joint venture of DSM and Roquette. 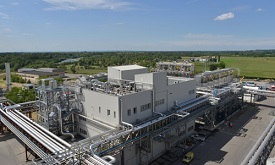 They produce biobased succinic acid in their facility in Cassano (Italy). In October 2014, Reverdia announced that it is now also licensing its Biosuccinium™ to its customers. The success of green chemistry is inseparably linked to the use of biotechnology and the use of genetically modified organisms or GMOs. In green chemistry, genetic modification (GM) is used in order to change microorganisms (bacteria, yeasts or moulds) in such a way that they develop another metabolic pathway from the organism’s food to the end product. And in order to restrict processes within the organism to those that we need for the production of the end product. This might be done by shutting down a variety of other enzymes, or by introducing genes of other organisms or plants. Researchers also use GM to enhance the organism’s productivity and stability. These are two essential conditions for a successful competition with petro chemistry. The science that encompasses all this is called industrial biotechnology. Each biotech company has its own biocatalysts: isolated enzymes that they know through and through; or entire microorganisms of which they know the genome, the metabolic pathways and their enzymes, which allows them to turn on and off switches in the metabolic pathway and produce new substances. Microorganisms can perform complicated reactions in one single process (without the need for separation and purification after each step) by applying a number of enzymes in series. This offers major advantages, and these become increasingly important in securing a market share. 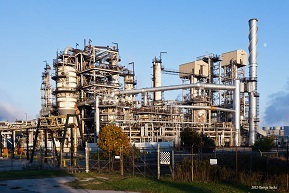 For the field of chemical industry is in an on-going development. Classical catalysts too improve their performances, cost-effectiveness is a moving target. Many now well-established green processes had to be improved year after year, and often it took decades to get at commercially attractive product concentrations of 10 to 20% or more. In 2014 Johan Sanders, now a retired professor from Wageningen UR, looked into the weak points of the petrochemical competition in his valedictory speech. His recommendation: try to find petrochemical processes with high capital costs; that is their main vulnerability, for those high temperatures and pressures require major investments. The first products in which green chemistry challenges petro chemistry, like succinic acid, exactly fit that criterion. Also check the chapter on green chemistry in our book Groene Goei (in Dutch).